Pedalling away from The Park, it began to spit, summing up a torrid UK week. Reasonably long and extensively pre-mapped ride ahead. Need to stop at Post Office, said Andy. Not a problem, though pre-lunchtime queue (see trip to Duncans Bakery) can be testing. Seconds became minutes. Folk flocking to Admirals for fish-on-a-Friday. He's still not out. Now down a quarter of an hour. Time to regroup, rethink and recalculate. Took winding route past the Control Tower Museum and the cop shop to emerge opposite that BT, the Black Tiles. 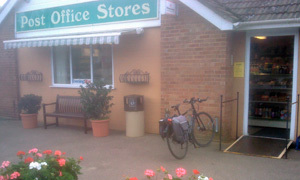 Left a bit and this'll more than do, the eBay-friendly Martlesham Post Office Stores. Handy bike parking, useful community notice board and some convenient dwarf lavender 'cos you never know. Local produce never tasted this good. Ending the week on a high, gotta love those huge flower pots. Not only do they guard against ram-raiders but they're an absolute riot of colour. If it was a car -- Bedford HA. If they were passing by -- Dominic Jephcott.